Easter this year will be a little bit unusual for us. You see, two of our three children are currently out of the country, one in Japan and one in Czechoslovakia, leaving only our youngest (our daughter) at home. Although it is just my husband and I and our teenager here, and we didn’t get around to dying any eggs this year, my daughter has been dropping hints all week about her Easter basket, wanting to make sure that she doesn’t get “shorted” or have that tradition dry up before she, the last child, graduates from high school! Of course, I had it all under control; I had already filled her basket with gift cards, lotion, makeup, and the obligatory chocolate bunny. I couldn’t bear to see the look of disappointment on her face had there been no basket and no brothers on Easter morning! Yes, over the years of raising our children we have carried on the family traditions of egg dyeing and easter baskets. We see them as just that…fun family traditions. Even though that has been our custom for many years now, our children, 16, 21, and 27, know what Easter is all about. They know that Jesus Christ is real and that the Easter Bunny isn’t. They know that Easter is about the resurrection of Jesus Christ and is the central tenant of our Christian faith. They know why we celebrate Easter. This morning, as we do every Sunday, we attended our home church. 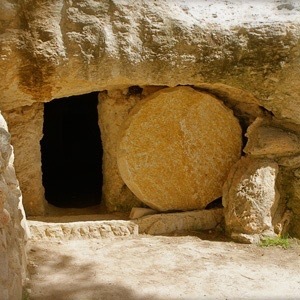 There we celebrated with our church family the hope and the miracle of the empty tomb. We pondered the fact that Christianity is different than any other religion in the world because…we worship a living God! We heard about the many appearances of the resurrected Jesus to his disciples and followers. We praised Him in song. We celebrated the king of kings! Because God is a part of our lives all year round, not just at Easter… and because our Christianity is a part of who we are day in and day out, our children have a solid foundation of faith that cannot easily be shaken by participating in a few family Easter traditions. Of course, I am supportive of those who choose not to allow their children to do so, and believe each family should do as they feel led. So What Does Easter Mean To Me? Because he is risen, I will one day walk with Him in heaven. Because he is risen, my sins are washed away now and forever. Because he is risen, I have an advocate this very day at the right hand of the Father in heaven. Because he is risen, the Bible is true. I pray that you and your family will have a glorious and meaningful Easter as you, too, celebrate the resurrection of Jesus Christ our Lord. This entry was posted in Holidays, Spiritual Encouragement and tagged Easter, faith, spiritual growth, The Resurrection. Bookmark the permalink. Thought I would re-share this Easter post that I wrote last year. Hope you enjoy it. Thank you, Lisa, for reading and commenting…even our big ones love the simple holiday traditions, don’t they? I am so thankful, as I know you are as well, that our children are well on their way to carrying on the torch of faith to their own children some day. God is good! I can relate to your post, Beth. It is such a gift to share the common bond of a faith-based celebration with our loved ones. Family traditions are so meaningful and sweet! This Easter, I feel an even deeper love for our absent family members, and our Risen Savior. Praise God from Whom all blessings flow!